RNA from cell-free urine was analyzed in an attempt to identify a microRNA (miRNA) profile that could be used as a non-invasive diagnostic assay to detect the presence of urothelial carcinoma of the bladder (UCB) and provide a discriminatory signature for different stages of progression. In addition, the presence of specific miRNAs co-isolating with urinary extracellular vesicles/exosomes was investigated. RNA was isolated from cell-free urine of patients diagnosed with UCB (TaG1, T1G3, ≥T2, CIS) and control patients (healthy control and UCB patients with no evidence of disease). MiRNAs were profiled by qRT-PCR array on pooled samples within each group. Validation of the miRNAs was performed on individual samples using qRT-PCR. Extracellular vesicles were isolated via ultracentrifugation. 236 miRNAs were detected in at least one of the pooled samples. Seven of the miRNAs validated on individual samples had significantly higher levels in the cancer group. A panel of miRNAs discriminated between cancer and cancer-free patients with a sensitivity of 88% and specificity of 78%, (AUC=88.8%). Researchers from Lahey Hospital & Medical Center recorded a sensitivity of 80% for TaG1, 95% for T1G3, 90% for ≥T2 with specificity of 77% for healthy controls and 80% for no evidence of disease. Select miRNAs were detected in extracellular vesicles of UCB patients and healthy controls, albeit at different levels. A: Mean miRNA levels in cancer and cancer-free samples. Error bars represent standard error above and below the mean. B: Mean fold change in cancer versus cancer-free samples. 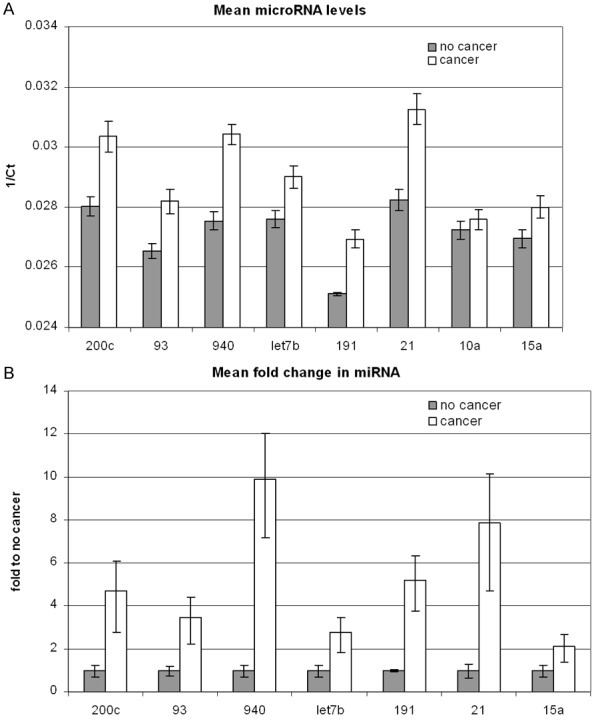 The 7 microRNAs with significantly higher levels in the cancer group (p<0.05) expressed as a mean fold increase relative to cancer-free samples. Error bars represent standard error above and below the mean. Utilizing this non-invasive assay, the researchers identified miRNA capable of detecting UCB and distinguishing different stages of progression, providing evidence that miRNA profiling in cell-free urine holds promise for the development of valuable clinical diagnostic tools.